Elena's mom in Mao-era China, standing on the Great Wall. Image courtesy the author. In photographs from my childhood, my mother always appeared incredibly stylish. That was the 1980s, and while she didn’t shy away from the Dynasty- and Dallas-era wide-shoulder looks, her wardrobe was otherwise a case study in classic sophistication. Nubby russet houndstooth blazers. Black stretch pencil skirts and silk blouses paired with navy or magenta pumps. A collection of white linen shirts that beautifully offset her mane of thick black hair, which she always kept in an easy low ponytail. What I didn’t realize until recently was that my mother was also an incredible latecomer to fashion. I knew that she grew up in China in the 1960s and 1970s during the Cultural Revolution, when everyone donned the same dusty blue, high-collared jacket mandated by Mao Zedong. But I had never done the math to find that she was in her mid-20s by the time Mao released his iron-clad grip over the country. In other words, she wore the same outfit every day through all the years my friends and I had agonized over whether to buy the gold lame mini-dress or all-black pantsuit for a school dance; belt or no belt; checks or stripes, and, if stripes, then, pencil stripes or pin stripes?! By historical necessity, my mother and her friends were all latecomers to fashion—and to the kinds of self-expression and self-discovery that fashion critically enables. My mother emigrated to the U.S. in 1989, just in time for me to experience light-washed jeans, Calvin Klein tees, and Nirvana grunge as I came of age, for which I will be forever grateful. Our teenage years couldn’t have been more different. Over popcorn and photographs from her youth, I sat down with my mother recently to chat about Mao-era uniforms, dressing to impress in her 30s and why it’s never too late to find your style. Most days now, my mother dresses in an American suburban uniform of twinsets, slacks and loafers for work, and leggings and fleeces for weekend jaunts around town with her friends. When she’s feeling curious about fashion, she stops by the local Eileen Fisher—though Eileen Fisher is precisely a brand founded on monochrome, timeless basics. Perhaps, in the course of a sartorial journey as bizarre as hers, some kind of uniform remains her baseline, her perennial point of reference. Old habits die hard, they say. Elena: Tell me about how you dressed when you were growing up. Did you dress up once in a while? Did you ever think about fashion? Mom: When Mao came to power in 1949, the prevailing attitude was “Down with the bourgeoisie!” We were all dressed simply in navy and black to express our patriotism – men, women, children. All the girls wore their hair in braids. The only clothes we really envied were the khaki green uniforms of the Liberation soldiers. We would dress up like them [laughs]. I guess you could say they were our fashion idols. On occasion, I would try on one of my mother’s floral button-downs, which she kept from the years before Mao. And I remember she had a red corduroy jacket that I loved. I dyed it black to fit in with my friends; I didn’t want to seem unpatriotic. Eventually, of course, the dye washed out and I wore the jacket like that. The corduroy felt so luxurious. 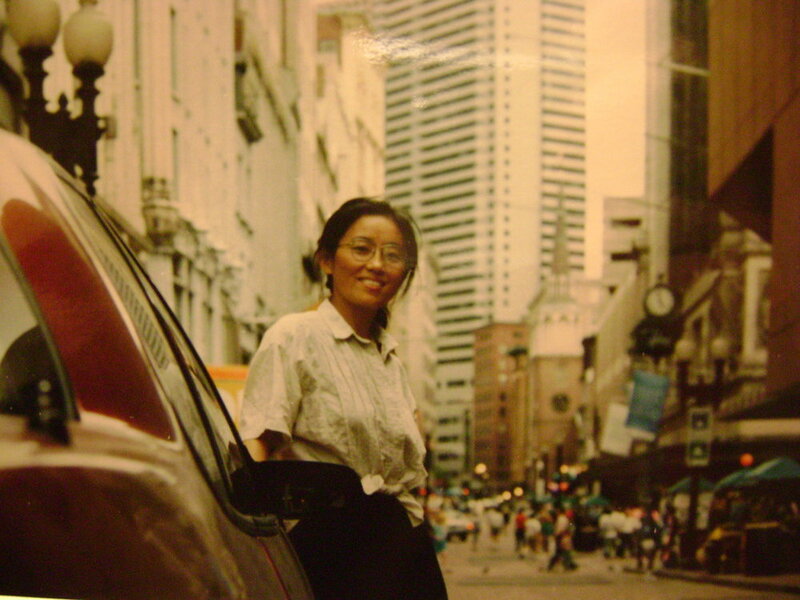 Elena's mom in the 1980s, after Mao instituted the Open Door policy. Image courtesy the author. So all the stores carried different sizes of the same Mao-approved clothes? [Laughs again.] There were no stores. The concept of shopping didn’t exist. I guess my mother went to the tailor to have my and my sisters’ outfits made, one for each of us, and we wore those every day. We lived by the popular saying: “New three years, old three years, sew and mend another three years.” Wearing the same outfit for a decade was standard. It must have been a shock to realize you could dress however you liked after Mao. When did you begin to cultivate your sense of style? The idea of having our own style had never occurred to us before. I was 26 or 27 when I wore my first collarless shirt, a gift from my aunt. I bought my first pair of jeans then, and I did get a stylish haircut. I would say I felt like I had a sense of what fit me well after you were born, in my early 30s. Did you feel like you were a latecomer to fashion? No, not at all. I’ve had plenty of time to explore.